Here’s the conundrum: Hearthstone‘s (Free) “Goblins vs. Gnomes" expansion has got you all in a tizzy, buying booster packs is already hard enough, and you’re probably missing cards from both the “Classic" and newly-released set. Free-to-play, uh, players aren’t likely to be flush with gold or Arcane Dust, so getting the most out of each purchase is crucial. Thankfully, two Reddit users have created a spreadsheet to help you do just that. A user named Tasloy did the heavy lifting first: using the drop rates and Arcane Dust values for Common, Rare, Epic, and Legendary cards, he set up a spreadsheet that automatically calculates the average worth of a random booster pack. As you get more cards, the relative value of each pack goes down, since you become less likely to get something “new." Manually input how many cards of each type you’re missing from either the Classic or Goblins vs. Gnomes sets, and Tasloy’s spreadsheet will tell you which type of booster will, on average, be more valuable to you. 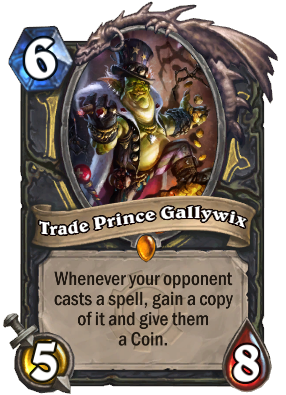 Tasloy’s calculation assumes that your cards aren’t golden and that you want two of each. The only problem is that keeping track of how many cards you’re missing can be a little unwieldy. Another user named ByronKur updated Tasloy’s original with a handy table for tracking your missing cards by class, rarity, and expansion. I now know, for example, that I have a full set of Commons for Druid and Shaman, but that in 9 months of regular Hearthstone play, I’ve never opened an Epic Mage or Warlock card. You can download it here. For now, most people are probably better off buying Goblins vs. Gnomes packs, but there are two things to keep in mind: the new set is roughly half the size of the original, and all Arena rewards from now on will be for Goblins packs. Eventually, Classic packs will have more bang for your buck, and you can use this spreadsheet to keep track of when that happens. In the meantime, I’m 500 Arcane Dust away from a Golden Legendary. Who should I craft first?